It’s an all too common scenario: A person is injured in a motor vehicle accident. The facts seem to show that the other driver is at-fault… but the other driver is telling a different story that seems to suggest that the injured person is to blame for the accident. In legal terms liability has now become an issue and must be sorted out before the injured person can get compensation for their injuries. This is where evidence (such as dash cam footage, independent witnesses, and more) has a vital role to play. Take for example the case of Doday v. Alberta (Motor Vehicle Accident Claims Act, Administrator), 2011 ABQB 161 [“Doday“]. Mr. Doday claimed that, while driving his tractor-trailer on St. Albert Trail one icy morning, he was cut-off by an unknown “phantom” vehicle which caused him to have to take evasive action. As a result of the evasive action, his tractor-trailer jackknifed, and he struck a light standard and barrier and was seriously injured. The Motor Vehicle Accident Claims Act Administrator (the “Administrator”), who can become involved in cases where people are involved in hit-and-runs or cases where the at-fault driver was uninsured, disputed Mr. Doday’s version of events. The Administrator argued that there were a number of other possible explanations for the accident (such as Mr. Doday over-breaking or over-steering in a way that was not appropriate for the conditions), and that Mr. Doday may have been the one who caused the accident that injured him. Therefore, a trial was held in the Court of Queen’s Bench of Alberta to determine whether Mr. Doday could prove “on a balance of probabilities that the accident was caused” in the way that he said it was (see para 3). Was a “phantom” vehicle to blame? Or was the “phantom” vehicle ever really there? The Court considered the testimony of independent witnesses and police officers who responded to the scene, as well photographs and computer-generated crash simulations of the accident scene and accident, in order to decide Mr. Doday’s case. All of this evidence was of the utmost importance to the outcome of Mr. Doday’s case, and helped the Court to decide in Mr. Doday’s favour. As a result, Mr. Doday was not prevented from seeking compensation for his injuries. Mr. Doday’s case illustrates the importance of evidence in motor vehicle accidents where liability becomes an issue and the other side is arguing that the accident did not happen in the way the Plaintiff claims or that the Plaintiff is to blame for the accident. Courts rely on the evidence presented to them to make findings about who is liable for the accident, the damages caused, and the losses suffered. Where liability becomes an issue, dash cam footage showing exactly how the accident unfolded can be valuable evidence to help your lawyer prove who was at fault. 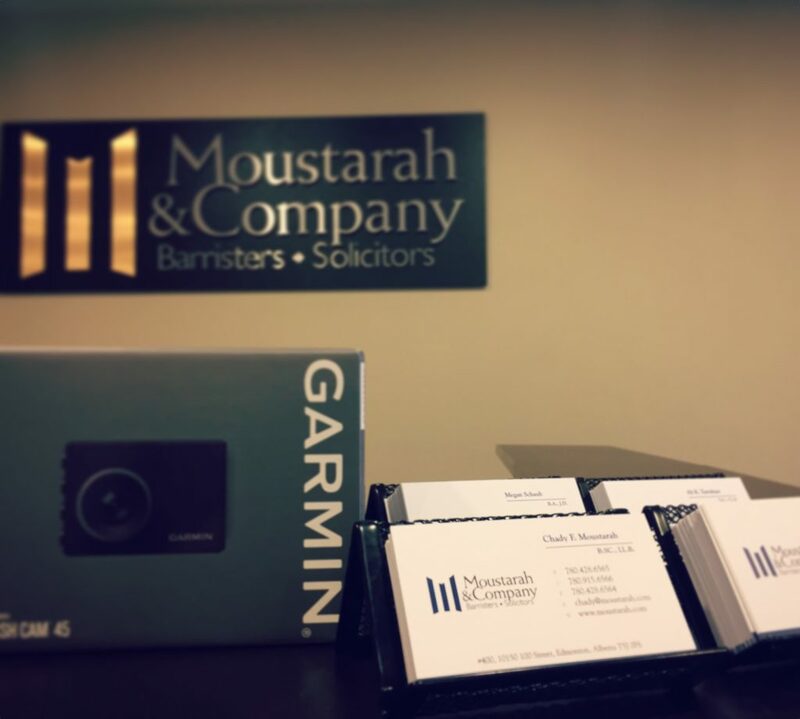 From now until midnight MST on August 15, 2018, head over to the Moustarah & Company Facebook Page and like this post to be entered to win a Garmin 45 dash cam. With 1080p video capture, forward collision and lane departure alerts as well as red light and speed camera alerts, this easy-to-use dash cam will have your back if you’re ever in a collision where liability becomes an issue. All you have to do to enter is go to our Facebook Page, and “like” our contest post. The contest is only open to residents of Alberta. The winner must attend our office to claim their prize in person. Proof of ID required at time of pick up.